After our Lonely Tree visit in the morning and Gangnam in the afternoon, we also dropped by Sinsa just to visit this cafe I found online while I was searching for unique cafes in Seoul. We got to visit this branch which I believe would be their tiniest one. It was raining that time when we got to the station, we thought the place is easy to locate even without the internet or the waze app and guess what, we end up soaking wet when we got to the cafe because we got lost for a moment. So always use the waze app, guys! I guess we already missed the easy route suggested before we decided to use the app so we were directed to the long way to get there. I realized it when we only took 2 to 3 turns to get back to the stations. Anyway, this branch doesn't look like a cafe in its first look, I even almost enter the building to look for the cafe but then we realized that the small door on the left is already the place we are looking for. The Banana Tree is a tiny little cafe that offers unique, cute and delicious cake and lattes. It is literally really small with only one employee and 3 to 4 single tables inside. 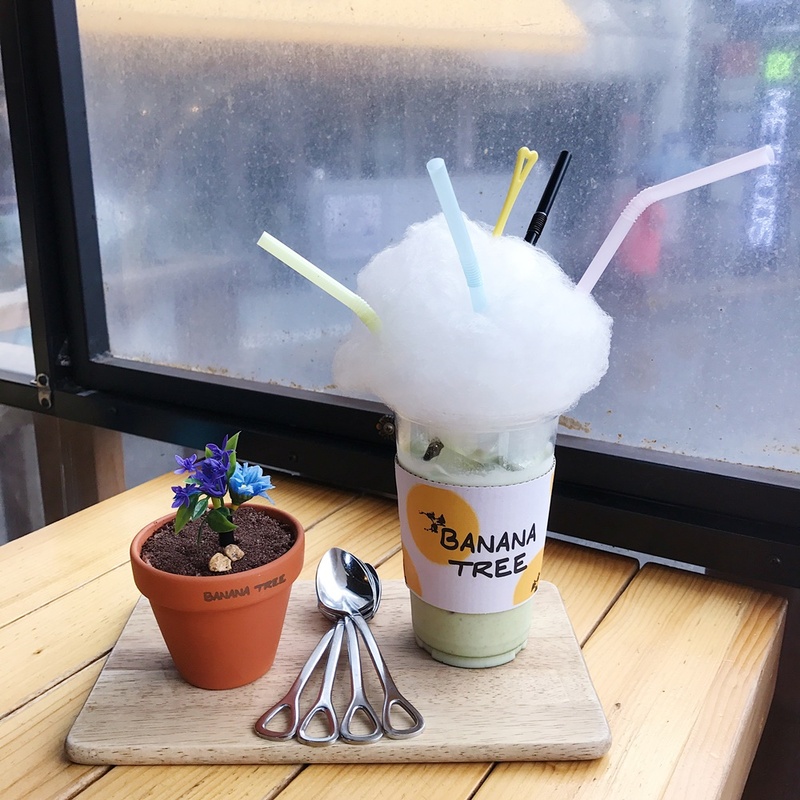 This cafe is getting popular in Seoul because they serve their food in a flower pot that you look like eating a real plant and their lattes have cotton candy on top with colorful straws in it too that is definitely 'instagrammable'. We weren't sure what to order on their menu because it doesn't have pictures in it but glad they have photos gathered from their customers posted around the cashier area that it got easy for me to just point out what I want to buy. Since we don't really eat banana cake, my siblings and I decided to just share (we just want to taste/experience it) and surprisingly, we all loved the cake. Their flower pot and their lattes cost around 6000 to 7000 won each and you can order it separately or together. This cafe is a must-visit when you are in Seoul especially if you want to take instagrammable photos you can post online. Anyway, they already have two branch in the area and it's really easy to get there if you follow the app starting from the station because the app might/will suggest the long way to get there if you missed the first route.